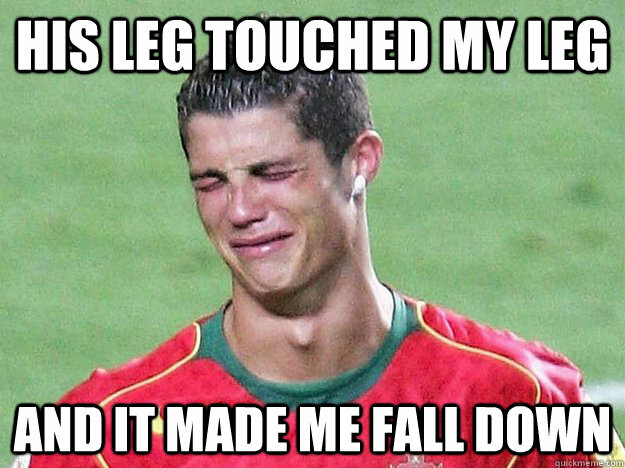 Cristiano Ronaldo kicked the soccer ball, but he may as well have kicked me in the stomach. The only thing about which I am fiercely and unrepentantly patriotic is also the only thing at which American exceptionalism has never allowed this nation to unconditionally succeed. I have never been affected by a sporting event in the way I was affected by USA 2-2 Portugal. I’ve been hurt worse, many times; I am a San Francisco 49ers fan, and saw them lose the Super Bowl and the NFC Championship Game in the last minute in successive years. I was not happy. This was not like that. It’s true that I wasn’t happy, but it was in a remarkably different and possibly unrepeatable way. After 90+ minutes of game time, I was something close to deliriously happy. The USA had, for the first time in its World Cup history, come from behind for what looked for all the world like a win, one which would advance them to the knockout stages. That all this came in this year’s “Group of Death”, after the team had defeated its old nemesis Ghana, made it so much sweeter. That it was happening against Ronaldo, whom (despite the many good things he does) I despise beyond reason, was just a sweetener. Ronaldo was playing hurt, which I feel should be acknowledged. He is also, unfortunately, the reigning FIFA World Player of the Year. It is easy to say in retrospect that I should’ve seen it coming. Yet… when Ronaldo’s cross found Silvestre Varela’s head and Varela’s shot found the net, I was not prepared. The moment unfolded for me in dreamlike unsurprise. There was no celebration from the Portuguese after the goal, which is not something that happens often in soccer. It almost felt preordained, everyone already having read the last page of the book. In my apartment, there was cacophonous silence. There was nothing for us to say, really. Everything was just there, in the air, unbidden, rendering words moot. I can speak only for myself when I say that I don’t remember much about the moments immediately following the match. I sat for what, in memory, feels like forever, but can only have been a few minutes. I roused myself by slapping an errant fork harmlessly off the living room table and tried to feel something. On top of that, the result did not lead to an elimination for the USA. It kept them from going through early, but it was not the worst possible outcome. The team’s odds are still good of getting through, and the hypothetical me from the beginning of June would have been happy to know they would have four points after two matches in this group. All those factors combined to give me something I had never experienced before: a gut-wrenching result with no closure. The match was not lost, the tournament was not over, the goal may end up being a mere footnote on the story of USA’s World Cup 2014 run. For the moment, there was nothing for me to focus on. The match was over, but the story was not. It is hard to come up with any other examples where this is even possible. The number of divergent factors that led to this specific emotional response may never be replicated. I certainly hope they won’t. The next day at work, people were remarking even more than usual on how tired I seemed. I agreed with them, mostly. It felt like explaining that I was experiencing a heretofore unknown combination of limbo and depression because of SPORTZ would have been too much to try and unpack. Nevertheless, my day consisted of counting up the hours since the game had ended and realizing I was still not over it. I think sports are a good thing, generally, and get irritated when people who do not enjoy them get snarky about people who do. Nevertheless, I do understand that some people care too much, putting too much of their happiness in the fortunes of their teams. I don’t feel like my reaction was caring too much.